RAWartist featured music artist and Semi-Finalist, Melanie Taylor is one of the three finalists selected out of 480 nominees that will performing at the Belasco Theater on November 14, 2013. The winner of the 2013 RAWards Semi-finals in Los Angeles will be announced at the end of the event. Performers will be graded in two ways, one by a panel of industry professionals based on a number of factors including overall performance, stage presence, and musical composition. The second factor for these finalists is crowd participation. 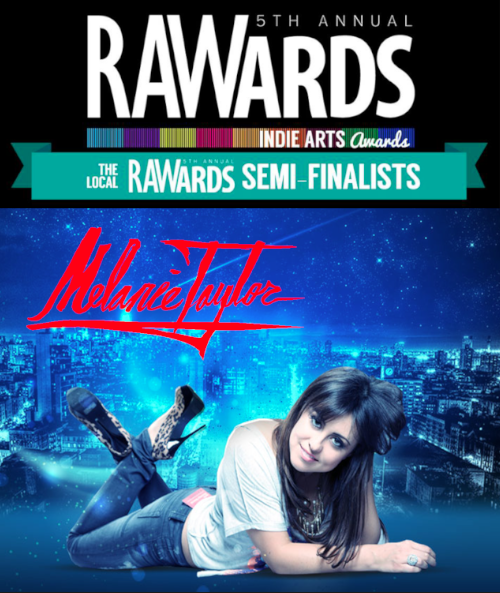 The artist that wins RAWards semi-finals competition will advance to the Finals in January 2014, where one music artist will be crowned with the title for Musician of the Year. Melanie Taylor is an award winning Pop Singer Songwriter originally from Carlsbad, CA. Now residing in Hollywood, Melanie now works with Sly Doggie Productions and Grammy Award Nominated Producer, Christian Davis (Lil Wayne, Mark Walberg, El Debarge, and Chad Brown). Melanie has a background in musical theater, show choir, and an obsession for Michael Jackson. Melanie's shows are a mix of theatricality, raw talent, and inspiration. Melanie recently won the award for the 2013 Best Dance Artist in The Artists In Music Awards and recently placed top 40 in the Indie Digital Radio Charts, as well as top 200 in the National Digital Radio Charts. Watch and listen because this girl is destined for greatness.